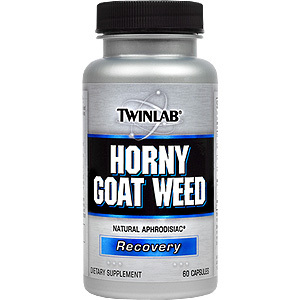 Horny Goat Weed is designed for both men and women. In addition to the Horny Goat Weed, the formula contains a proprietary blend of standardized herbs including MacaPure®, Mucuna Pruriens, and Ginseng, Damiana, Ginkgo, and Cordyceps were combined to complete the formula. 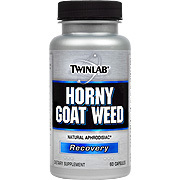 Horny Goat Weed is an all-natural botanical sexual enhancer & libido stimulator. It is a botanical complex that contains Horny Goat Weed (yes that is the name of the herb), Maca, L-Dopa and other exotic botanicals. Horny Goat Weed's combination of botanical ingredients, namely Horny Goat Weed, Maca, Mucuna pruriens and Polypodium vulgare may enhance sexual performance through a variety of mechanisms such as increased testosterone production, increased energy and increased sexual hormone production. As a dietary supplement, take 2 capsules daily. May be taken 60-90 minutes prior to physical exertion. Taking more than the recommended amount will not improve results. Damiana Leaf, Cordyceps, Gingko Leaf, Eleutherococcus senticosus Root, Yohimbe Bark Extract. Other Ingredients: Gelatin, Cellulose, MCT, Purified Water, Silica, Magnesium Stearate.